The mission of the Pollys Club is to raise money for charity. We having been doing this since 1964 by organising GLBTIQ+ themed dances, which are safe, all-inclusive, cost effective and fabulous fun. The funds raised are donated to charities focused on men’s health, women’s health, youth health, mental health and animal welfare. 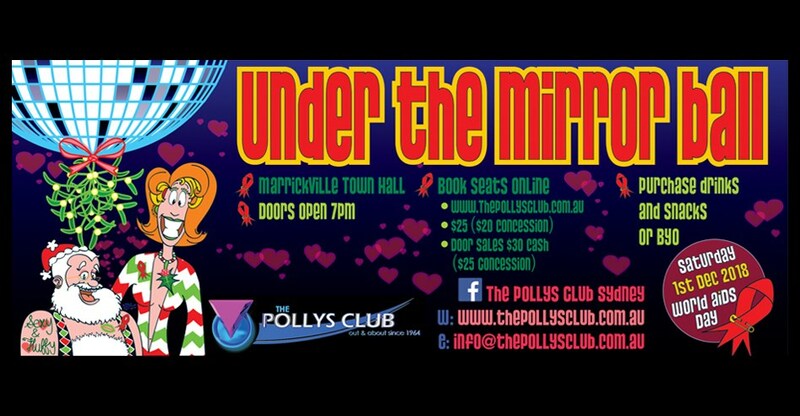 Join us for the Pollys December dance - Under The Mirror Ball . As usual, doors open at 7pm for a dance set which is a meander through the decades. Our drag show commences at 9:30 and yes, we start on time. After the show, stay on for a more mixed DJ set - still retro, still dancy, still fabulous.